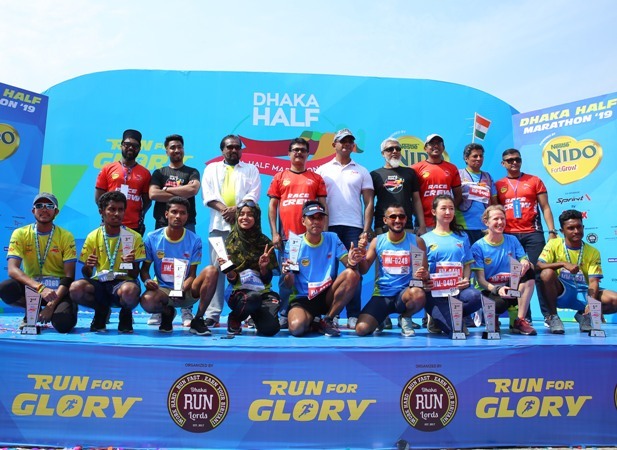 Dhaka Half Marathon 2019 was held on Friday to highlight Bangladesh on the global platform from a new perspective. Dhaka Run Lords organised the meet which consisted of two events namely Half Marathon (21.1 KM) and Mini Marathon (7 KM). Mahfuzul Haque (1:24), Mahbubur Rahman (1:28) and Md Sajjad Hossain (1:29) were awarded first, second and third prize respectively in the half marathon men’s category while Jane Crowder (1:49), Lisa Petzal (1:53) and Lina Lee (2:02) were awarded first, second and third respectively in the half marathon women’s category. In the mini marathon men’s category, Mir Rasel (30:22), Probhat Choudhury (30:30) and Sohel Rana Sohan(31:41) were awarded first, second and third respectively whereas Mariana Ignat Cristina (39:40),Neda Sakib’s (47:50) and Anisa Tasmia Karim (47:55) were awarded first, second and third respectively in the mini marathon women’s category. A total of 1200 participants took part in Dhaka Half Marathon 2019. The half marathon and mini marathon event participants started their run from Hatirjheel Police Plaza. They ran across Hatirjheel Expressway three times to complete the targeted 21.1 KM. The allocated time for this challenge was 3 hours 30 minutes. Mini Marathon started fifteen minutes after Half Marathon. The participants of this challenge ran through Hatirjheel Expressway once to complete their 7 KM run. The time allocated for was 1 hour for mini marathon. Bangladesh Parjatan Corporation Chairman Akhtaruzzaman Khan Kabir distributed prizes among the winners as the chief guest. Senior officials from sponsors and organisers were also present during the prize giving ceremony. The event was powered by Nido from Nestle Bangladesh Ltd while Sprint from Apex Footwear Ltd was the co-sponsor of the running meet. Gloria Jean’s Coffee, Saffola and Polar Ice cream were gold sponsors. The event was co-organised by Bangladesh Parjatan Corporation whereas BDRunners provided community support for the event. Garmin was the supporting partner while Radio Spice96.4 was the official radio partner; spice catering was the food partner and ISOTONIKS was the hydration partner of the event.